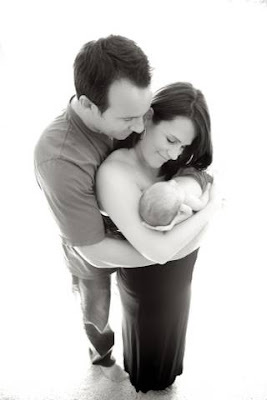 On July 30, 2011, after a generally normal pregnancy, we welcomed our beautiful Baby Reesa into the world. It was the happiest day of our lives! Reesa was delivered via emergency c-section because her heart rate was dropping during labor, which is a common occurrence during child birth. Reesa was 7lbs 13oz, 21 ½ inches long and had an APGAR score of 9. It was such a joyous occasion as Reesa is our first child and the first grandchild on both sides. The first 6 months of Reesa’s life were completely normal. She was breastfed and was a terrific eater. Her height and weight were always in the 80th percentile range for her age. She was also sleeping through the night by 6 ½ weeks. We introduced solid foods at 5 ½ months and it was so much fun to watch her squeal with excitement in her highchair. Then at 6 ½ months we started to notice some changes. We took Reesa to the pediatrician because of a typical stomach sickness. While there we mentioned that Reesa seemed to be a bit behind on some of her milestones (specifically grasping and rolling over), she also had some stiffness in her limbs and clenched her fists more than other babies her age. We knew that every baby develops at different rates so the concerns weren’t terribly alarming. However when the doctor measured Reesa’s head he noticed an unusually large jump in size from her 6 month appointment. Out of an abundance of caution he asked that we check into the hospital for an MRI to rule out Hydrocephalus (fluid in the brain) which can be common in infants. The pediatrician said he would have a neurologist examine Reesa while in the hospital to address the developmental delays that we had mentioned. Our main concern was Hydrocephalus the neuro exam was more of secondary concern. The MRI came back negative and it turned out that Reesa just has a big noggin (thanks to her dad and grandpas!). However the neuro exam was much more distressing. After a 20 minute clinical exam the pediatric neurologist told us that he feared Reesa had a Leukodystrophy, a group of rare genetic disorders that affect the white matter in the brain. He said he would need to do blood tests to confirm or rule out, and the results wouldn’t be back for over a month. After researching Leukodystrophy in the hospital it hit us that our baby might be very sick with an extremely rare and grim disease. We were horrified. However this was not a diagnosis, it was simply the doctor’s opinion after playing with Reesa for 20 minutes. After going home and regaining our composure, we were hopeful that the blood tests would come back negative. The odds were in our favor as this disease is extremely rare. The next 5 weeks were unbelievably difficult, not only anticipating the test results, but Reesa also started to exhibit some worrying changes. Reesa began having feeding difficulties and starting losing a significant amount of weight. Our pediatrician admitted her to Phoenix Children’s Hospital. After 6 grueling days of tests, IVs, X-rays, swallow studies, an endoscopy, colonoscopy, and lots of poking and prodding we were released from the hospital with no answers but Reesa was now on an NG feeding tube to supplement her bottle feeding. We still had lots of hope that this was just a bump in the road but in the back of our minds we had a sinking feeling. The next couple of weeks were absolute torture. Reesa became extremely irritable and at times inconsolable. She would cry for hours to the point that her clothes would be soaked with sweat. She would hardly sleep. It was hell and we would have never have been able to get through it had not been for our new, live-in nurse (Grammy Flo). We, and all of our friends and family, prayed day and night that all of the test results would come back negative. On April 2nd, 2012 we received the phone call from our neurologist, the test results were back and Reesa was diagnosed with Krabbe Leukodystrophy, an extremely rare genetic disorder with no cure and generally fatal before 2 years old. Our beautiful baby girl is dying. There are no words to express the shock and devastation that we are feeling. We’ve been overwhelmed with an outpouring of support from friends and family. The purpose of this website is to keep all of those who love Baby Reesa informed about her status and the ability to share in her life. Please come back often and share your feelings and comments. Knowing that we are not in this alone gives us the strength to get through this challenging time. As dire as Reesa’s situation may seem, we are committed to making the most of every moment we have with her. Every day is a blessing. Our love for each other and for her will carry us through. Sean and Jamie, I dont really know you guys but I have met Jamie once through my wife Linda Ramirez. My heart goes out to your baby and your family. We will be praying for your family. I don't know you but a friend shared your website on her Facebook. I am praying for you and your beautiful family. And gave birth in July too! I just look at my baby and can't begin to fathom what you must be feeling. I'll be praying for knowledge of doctors and hospitals and miracles too! I do not know you. I was forwarded your blog through a friend. I must say that I am so touched and amazed by your strength. Reese is such a beautiful little girl. God is amazing!! Miracles happen! My prayers are with Reese and with the both of you and your family. Bless you all!!!! Jamie and Sean thank you for sharing Reesa's life with us. Our hearts are broken for you. Love and prayers from the Toennies family. Always thinking of your family and will continue praying for you to have the strength everyday to get through. Im not going to pretend to imagine what you and sean are going through, but know lindsey and I are here to help in any way. We love you all so much. This is absolutely heartbreaking. My thoughts are with you as you spend this precious time with your cute daughter. I do not know you, but have found this through a friend on facebook. God bless you and your little one, she is such a beautiful baby girl. Although I don't know you, this breaks my heart! I have a child and another one on the way, and know that feeling of eternal love. You two are amazing strong people and may God bless you with all of.His strength! I'm praying for you guys and that beautiful little girl! My heart goes out to you-- Please know that I am praying for you and your precious little girl! if there is anything that I can do for you or your family in anyway please know that I am here for you! God does not bring us to it without bringing us through it! have faith! Reesa is such a beautiful baby! My heart goes out to you and your family and will keep you all in my thoughts and prayers. We are so sorry to hear the sad news about baby Reesa. This website is an important way for everyone to keep up with her. We are so sorry that Reesa is sick and that you are going through this difficult time. You are all very brave. We were stunned to learn about this news. Your family will be always be in our thoughts. We have been praying for you & Reesa. She is so beautiful. This situation has broken our hearts too as we also struggle to understand. We are also giving thought to the remaining family members as well. We can only imagine how difficult this is for all. Love & peace, Glenn, Laurie & kids. Do you really have the faith to believe and to endure the test? Your faith will be tested in ways that seem unimaginable. At times it is even harder to comprehend the meaning of it. Wondering if you can stop the test, realizing that your faith is weak. You are not expected to do it all by yourself. Don’t let pride make you fail. God allows trials to happen in your life to see if you are willing to grow. His timing may not be on your calendar, but it was on His before you were born. And He will strengthen you in your trial with His love and grace. Then you will see miracles in your life that seem impossible for man. Your faith is tested to see if you have the conviction to believe. And there is nothing that is kept secret from Him because we are His children. Because you really did have the faith to believe. Have faith that God can do a miracles! unfortunately, once symptoms are present, the patient is not a candidate for either treatment. As many others, I too read this via a link on FB shared by SWWC Physicians. I am a L&D nurse at Good Sam. My heart goes out to you and your family as you try to make sense of the devastating news you have received. I'm sure thus has just been so much to digest. Every day we celebrate birthday parties with patients. We send them home with their "healthy" babies. I say healthy in quotes because, there are the patients we send home and then have something happen with their seemingly normal, healthy baby. I will be praying for you and your family. May God hold you all in the palm of his hand as you press on in the days, weeks, and months ahead. You have a special little girl and only God knows her purpose here on this Earth. I don't know what else to say other than, this isn't fair. I hope you find comfort and solace knowing that there are many out there thinking of you all and I know, I'll be praying for your sweet little Reesa. Dont Kno Yu Guys, But Yur Website Was Shared on Facebook. I Couldnt begin to imagine wat yur going through! Myy prayers go out to yu and baby Reesa. I pray she has the strength to fight for a long time! Hoping doctors find answers for yur family. Jamie and Sean, I saw your post on the SWW fb page. I have a friend here in town whose son was also diagnosed with Luekodystrophy. She said she only knows of 3 other families in AZ! Her blog is rydersjourney2009.blogspot.com. I thought it would be helpful to share information on therapists, doctors etc. Many thoughts and prayers for your family! Sean, it has been a very long time! This is DeeDee (Schur). My heary and prayers are with you guys! I can only imagine how difficult this is for all of you. Please know you have a lot of love and support back home from all of us! If there is anything that we can do, please let us know! Hugs, loves, and prayers to you and your family! I also read this on FB. Your story is much like mine. My daughter started out life like your baby, same symptoms. She has Infantile Alexander disease, a leukodystrophy very similar to Krabbe. Let me tell you the doctors are not always correct, many of these kids live longer lives. My beautiful daughter is 11 years old! She still walks and talks and eats. she had failure to thrive at age 2 and weighed 19 pounds until she was 3 yrs. She is now 73 pounds! Get all the therapy you can! I also breastfeed her for over a year, she didn't eat real food until she was 3 years old. My daughter is mentally retarded , but she is such a gift to all who know her. My thoughts and prayers are with you... Reesa is adorable and how wonderful that she is surrounded by Love! A friend of mine shared your story with me, and I wanted to let you know that Reesa and your family are and will continue to be in my prayers. Watching the video of baby Reesa ripped my heart out. She's so beautiful and ever-so loved; she couldn’t be in better hands. Your strength is amazing, and your situation is unimaginable. Blessings to your family. My daughter Emma just passed away from krabbe. I know how you feel and the long road ahead. I'm not sure if you know her but you should contact Dr Maria Escolar. She is stable the children's hospital in Pittsburgh. And she is an expert on krabbe and she's amazing. Thank you for sharing and I will keep your family in my prayers. Beware that you don't look down upon a single one of these little children. Just saw a link to this on Twitter. My heartfelt prayers for you and Reesa. May the Lord strengthen you during this time and bless Reesa with unending love. My heart aches for you all. Soak up this time with your sweet girl. My prayers are with you. I know your pain... God Bless You! Im so sorry to hear this, my sister died at a very young age. I know thats nothing like having a child in this situation. But you and your family will be in my prayers. God bless you. I am saddened to know that this sweet little girl is going through this and had no control of he outcome. Life is not fair when it effects chidden. I wish you all the best in this time of need and focus. After reading through the recent blogs, I wanted to report that Reesa has been to see the amazing Dr. Maria Escolar in Pittsburgh. She is now on new meds and enjoying her life more. We also are enjoying her more. Dr. Escolar is so knowledgable and gracious and her team is awesome. I have recently made PEACE with the knowledge that Reesa was given to us by God because Sean and Jamie are the best and most loving caretakers of her life. Reesa has an amazing global community praying for her and embracing her needs. God is good and I thank Him for every moment that we get to spend with our Angel Baby. What a beautiful baby girl! May God bless her and all those who love her! What an angel you truly have! I will be checking this website for futher updates. Many prayers heading your way from my family! I meet you guys last Friday night. What beautiful family and Reesa is gorgeous. Thank you for sharing your story and our thoughts and prayers are with you! I will continue to follow her story! I do not know you I heard about Reesa while watching the Cardinal game tonight. You have been blessed with a very special baby as a gift from God. He knew she would need a special kind of care and love. God chose you to be the parents to provide that special love. She is a beautiful baby and I will pray without ceasing for you and your family. May God bless you all! Hello. My name is Becky Ruth. My grandson, Brady Alan Cunningham was diagnosed with Krabbe in August of 2008. He passed away 10 days before his 1st birthday, on April 6, 2009. I am from Festus, Missouri (about 30 miles south of St. Louis), and my daughter and son-in-law live in Campbell, Missouri (about 2 1/2 hours from St. Louis). We just heard about your story because of the St. Louis Cardinal Fundraiser. I would love to speak with you when you come into St. Louis for the fundraiser if possible. We have worked diligently here in Missouri and passed a newborn screening law in Brady's name to include Krabbe and 4 other Leukodystrophies. However, our Department of Health and Senior Services decided to cut corners and went with a company that has not developed the test for Krabbe instead of using the Mass Spec Machines that does test for it accurately. All children in Missouri were supposed to be tested starting July 1 this year, but sadly that is not happening, and we are fighting the state on this. I want to offer our support in any way we can because our family understands what this disease is and have walked through it. We have made it through because of our strong faith in God. Please let us know how we can be of any help. We will keep Reesa and your entire family in our prayers! 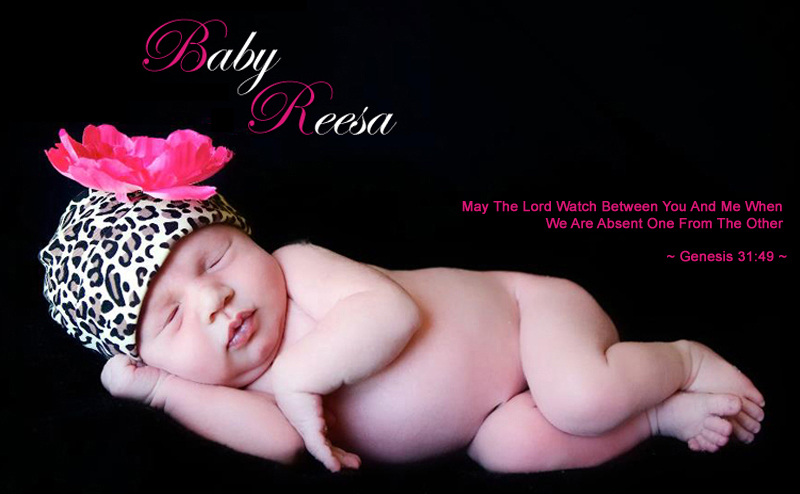 I am so deeply sorry to hear this news about baby Reesa. She is a very precious baby, enjoy what you do have and make the most of it. We will continue to keep you all in our thoughts and prayers. Let me know if there is anything I can do to help out. iam truly so sorry for the situation you guys are in. We will keep you guys in our prayers. because of skip schumacher's mention of baby reesa before a cardinal's game, i learned of this devastating disease and baby reesa's prognosis. as a parent of 3, one of whom spent a significant time in the ICU because of a dire (but survivable) disease which she overcame, i have some understanding of your breaking hearts. i came to quickly comprehend, in an emergency room, that my child was not merely mine. she was on loan from God. we were so incredibly fortunate to not have to give her back at that time and she is healthy today. but, i am grateful that i learned that difficult lesson. God has a plan for reesa - and it is a good one altho' it might take her away from those who love her in this world. she will become your angel and will always be near you. Hugs and Kisses, alot of love and alot of prayers for you Baby Reesa on your Birthday. Your story is so heart breaking and your family is in my thoughts and prayers. Reesa is so beautiful! Thank you for sharing her story and pictures.